When a wealthy Turkish aristocrat arrives in a humble Italian town, the married women roll their eyes in delight, their rival lovers lose out, and the husbands rage with jealousy. These may be silly clichés, but they are the subject of IL TURCO IN ITALIA and the composer plays with them – quite deliberately. 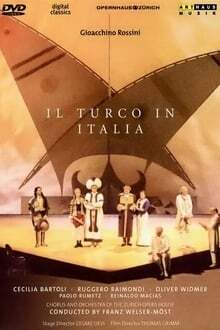 He knows that he is putting archetypes of Italian comedy on stage with figures such as the exotic lady-killer Selim, the young woman Fiorilla, who is chained to the stove at home, but adventurous, and her husband Geronio, who is ridiculous because he is much too old – and relishes the ironic exaggeration. Franz Welser-Most conducts the Zurich Opera House Chorus and Orchestra in this performance of Rossini's opera buffa. We don't have any reviews for Il Turco in Italia. We don't have enough data to suggest any movies based on Il Turco in Italia. You can help by rating movies you've seen.